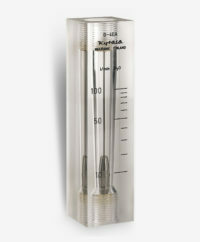 Flow meter Model D is ideal for gaseous and liquid applications, with typical uses including water treatments, gas flow measurements and sealing water measurements. Similar products include the Model C.
This component is constructed from a machined acrylic and features BSP 1” connections. Quick, accurate measurements can be taken using the easy to read scale, and the unit can withstand temperatures up to 75°C and pressure up to 20 bar (30 bar/30°C).